By Jim Dower: Dillian ‘The Body Snatcher’ Whyte weighed in at a chunky looking 258 pounds on Friday for his fight against former WBO heavyweight champion Joseph Parker this Saturday night at the O2 Arena in London, England. The 30-year-old Whyte’s weight for the fight is four pounds heavier than the weight that he came in for his last fight against former WBA heavyweight champion Lucas ‘Big Daddy’ Browne on March 24. Whyte weighed 254 lbs. for the Browne fight, and he fought well. Unfortunately, it looks like Whyte has let himself go a little and either eaten too much or not been working out as much since then. At today’s weigh-in, Whyte’s midsection looked visibly flabby. He’s obviously carrying around excess baggage around the belly area. Being flabby for a fighter like Parker is the wrong thing for Whyte, because he needs to be quick on his feet to match the superior speed and movement of the New Zealand fighter. Parker is not only the quicker and more mobile of the two fighters, but he’s also the more powerful and younger. Whyte and Parker both need a victory to keep in the hunt for a rematch against Anthony Joshua. Both guys have lost to him in the past. Parker’s defeat to AJ came last March in Cardiff, Wales. Parker did a good job and presented big problems against the taller Joshua when he was able to get in range to let his hands go. Parker, 26, looked in much better shape in weighing in at 242 pounds, which is six pounds heavier than what he weighed for his last fight against Anthony Joshua on March 31. Parker weighed 236 pounds for that fight. Parker says he’s going to take the fight to Whyte and knock him out. Perhaps Parker doesn’t want to wind up losing a decision to the home fighter Whyte. If Parker boxes, he could be putting himself in the position of losing. As the visiting fighter, Parker needs to go after Whyte to knock him out so that the judges don’t have a say so in the final outcome of the contest. 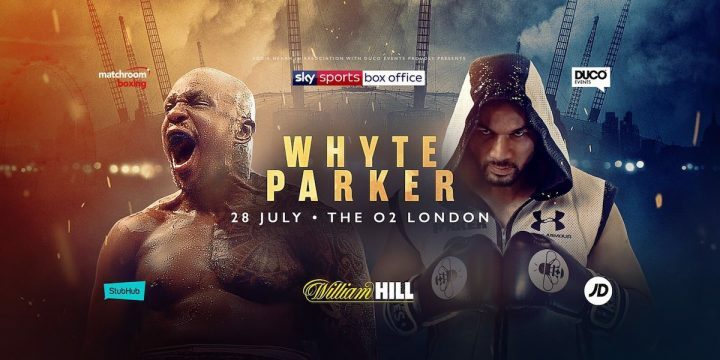 Whyte’s sparring partner Fraser Clarke believes that he has one-punch power that could give Parker problems if he lands one of his shots on the button on Saturday night. ”If Dillian Whyte hits Joseph Parker clean on the chin with those small gloves, he’s going to sleep, and that’s the top and bottom of it. I don’t care how granite your chin is,” Clarke said to skysports.com. Regardless of what Clarke says, Whyte isn’t a one-punch power and he doesn’t possess the same type of strength that Parker has. Whyte has a better jab and he’s a superior body puncher than Parker, but he doesn’t throw with the same kind of power to the head. Parker is stronger and much faster of hand and feet.